This is my first post at violinist.com. I've been happy to see a strong viola presence on violinist.com, as I think there is more that unites us than divides us! One such area I'd like to focus on in this post is etudes. Though there are very fine viola-specific etudes by Campagnoli, Fuchs, etc., they are often used in conjunction with the core etude repertoire: Wohlfahrt, Kayser, Kreutzer, Rode, Gavinies, Paganini etc., which is the exact same repertoire violinists use. I would argue that these are not even transcriptions when played on the viola. In the more than five hundred years the viola has been around, it has only been possible to get a degree in viola performance in the past one hundred. The standard route was to learn first the violin and then switch later. Certain well-known viola teachers in the 20th century wouldn't accept students who didn't have solid training on the violin first. In recent times there are many examples of successful violists who have started on the viola, of course, but the violin technical repertoire is still used, just a fifth lower. Paganini used his caprices as etudes; other violinists would take hotel rooms next to his, and they could hear him quietly playing through them. When Paganini played the viola, it seems highly unlikely to me that he warmed up on different material, which he never published. It seems most logical to me that he played his caprices, just a fifth lower. It is for this reason I don't view them as transcriptions and believe viola players have just as much right to them as violinists. A controversial statement, but in my view the technique-- using the word in a broad sense--- for the violin and the viola is entirely the same. Vibrato is vibrato. You might alter your vibrato when going from the violin to the viola, but it is still basically the same thing. Certain techniques might even be altered in going from a bright, responsive viola to a darker, less-responsive one. Adjustments will always be made, still the basic techniques are all the same. Then there is the issue of practicality. Many violinists switch to viola, and many people who play primarily one instrument will also teach the other. To focus only on viola etudes would seem to me to be shutting a lot of doors. Furthermore, students switch teachers. I think it's great that there's a fairly standardized progression of material that can be continued with someone else. A great etude is in certain ways the opposite of a great show piece. Novacek's Perpetual Motion is an example of a great show piece. It sounds harder than it is. The composer cleverly kept going back to open strings for the low notes. Compare that to Paganini's 12th Caprice, where the low note you keep going back to is the first finger in half-position, making the upper notes a reach of a tenth and at times even a twelfth. Think how much easier that would be down a half-step! To a non-string player, the huge difference in difficulty isn't entirely obvious. But for the string player, there is great value in that caprice precisely because it's so difficult! There is some overlap between etudes and show pieces that should be acknowledged. About a third of the Paganini Caprices are popular as show pieces. Before Ruggiero Ricci made the first complete recording on violin of all 24 Caprices, and before Emanuel Vardi (with whom I studied) made the first complete recording of them on viola (both mid 20th Century releases), simplifications were common to turn specific caprices into show pieces. Today this is less so, though it still happens from time to time. As technical studies, the simplifications make no sense. A study in fingered octaves in high registers (Paganini 3), loses its raison d'etre when simplified to octaves with 1 and 4 in the lower positions with only the lower note trilled. Changing 4-octave arpeggios into 3-octave ones, tenths into thirds, fingered octaves into regular octaves etc. may make sense in the transcription of pure concert music, but in technical material, this of course removes the challenges, defeating the purpose of the study. The greatest overlap is of course in the Bach Sonatas and Partitas, which is valuable entirely as pure music and as material for technical development. Jascha Heifetz called the Sonatas and Partitas 'the bible' (and the only known solo performance he gave on viola was of the Chaconne from the 2nd Partita.) Others including Oistrakh referred to the Paganini Caprices as 'the bible', while Menuhin was most diplomatic when he called Bach the Old Testament and Paganini the New! As a composer, it's great to have all of these techniques available. I've used double-octave trills in my writing, unisons, tenths, and all sorts of difficult techniques found in our etudes. It allows more possibilities for different colors and effects. Though I also play the violin, the viola has been my central focus both as a performer and composer. As a composer I see great differences between the viola and violin, but as a performer I wouldn't want to see those differences exaggerated. The etudes of the violin repertoire are just as much for violists, and in my opinion it should (and will) stay that way. September 30, 2016 at 12:13 AM · You play tenths on the viola????? I actually find tenths a great way to relax the hand. September 30, 2016 at 04:17 AM · I agree that regular violin studies should be playable on the viola without really much adaptation needed. September 30, 2016 at 05:03 AM · Agreed, Scott. 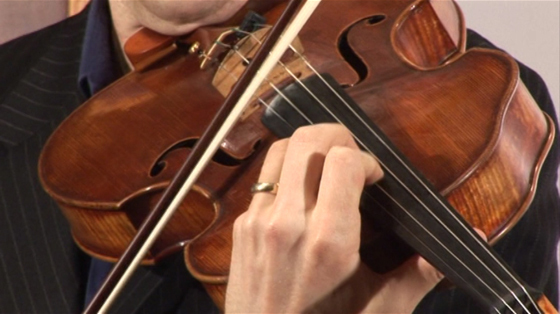 Violin etudes are indispensable for viola technical development. This is as logical as 3-octave scales and arpeggios, for which there are no viola-specific versions. Not mentioned in your article are the Mazas etudes, which are technically challenging but with more musicality than Kreutzer. They are important enough that I have combined selected etudes from Books 1 and 2 in a new edition for viola. September 30, 2016 at 11:22 AM · Very interesting post, thank you Scott! So, I take it that you think the viola should be played just like the violin, leaving fingers down as much as possible, it is just that the stretching required is larger? Because a viola friend of mine told me that the viola is played totally different from the violin, not leaving fingers down and in fact playing more like a cellist, shifting constantly. September 30, 2016 at 12:30 PM · Paul, I wouldn't say tenths are in the core of the standard repertoire, but they're not only in my own pieces either. Paganini's viola sonata and Frank Proto's Soundscapes come to mind, but I'm sure there are other pieces. I don't know the Casimir Ney pieces, but I can imagine a tenth or two somewhere in there. Even for music that doesn't stretch that far, I still think theyre useful to practice. Larry, congratulations on your new edition of Mazas! I'll keep an eye out for it. Jean, yes, the distances are bigger. There are times to keep certain fingers down (playing a fast descending scale, returning to a certain note) and there are some exercises that encourage that (Schradieck, Sevcik), but no, I wouldn't advocate keeping the fingers down all the time on either instrument. Often, having more than two fingers on the board at one time can tie up the hand. And if you can reach it, I wouldn't say you have to shift more on the viola than the violin either. But some people with shorter fingers do need to because the stretches are too far. Part of the reason I wrote the post is that there are some violists who want to pretend the viola is as different from the violin as it is from any other instrument and think violists shouldn't use any violin materials at all. Certainly in the area of technique I don't agree. If you read The Way They Play series of interviews as well as Ricci's book on Paganini, you'll see fairly wide differences in technical ideas among violinists. These are mirrored in the viola world as well, but it's not a violin vs. viola thing. October 1, 2016 at 08:40 AM · Thank you Scott for a great post! I totally agree with you in all points. You don't have to bring the Gavinies etudes on viola up to the level of a public performance, but you certainly learn a lot by practicing them and understanding their technical concepts. It can feel like having the luxury of taking a lesson from a genius teacher from the past. October 3, 2016 at 02:17 AM · Thank you for this article. I'm an adult beginner, pretty much on both the violin and viola. I often find myself taking what I've studied on the violin and working it out on the viola. While I have much more familiarity on the violin, I find the viola to be easier to stay in tune with intonation. Weird since the intervals are stretched compared to the violin. I picked up a Whistler First position scale book, can you recommend any other material so I may continue my studies? Thank you again. October 3, 2016 at 10:17 AM · Hi Don, it's always difficult to recommend materials without first hearing how you play, but as you wrote that you're an adult beginner, the Wohlfahrt etudes are probably a good place to start. On violin, the first one is all in C Major (no sharps, no flats), all in first position, and all eighth notes (no varied rhythms.) He then methodically adds difficulties with each subsequent etude. Especially with études, you should have a private teacher. It's easy to play them incorrectly (in many ways) without noticing. Good luck!